Yennik, Inc. the acknowledged leader in independent-Internet auditing for financial institutions. For information about the different web site auditing options and pricing, please complete the web site audit information form. Let us audit your web site to help you comply with the federal regulations affecting a financial institution's web site. Our audit follows the FFIEC Internet and weblinking guidelines, which includes auditing and continuous monitoring, as well as the Americans with Disabilities Act. We conduct hundreds of web site audits annually. Our web site audit clients range in size from $12 million in assets to over $3.5 billion. Internet access allows us to perform the initial audit and monitoring from our corporate offices. Our years of examining experience gives us the understanding of federal regulations necessary to properly conduct your web site audit. This understanding and experience will provide you with a professional and constructive audit. If your institution is on the Internet, the FFIEC states that your institution web site is required to comply with consumer compliance, advertising, notifications, Americans with Disabilities Act, and other federal regulations. We have identified 17 federal regulations and over 130 issues that relate to a institution web site. 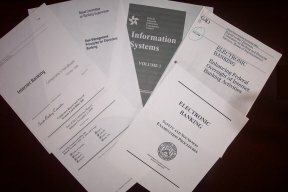 The implications of emerging electronic financial services, which includes your institution's web site, could cause unwanted criticism from examiners as well as potential liability to your institution, officers, and directors from civil money penalties and law suites. Chart of percentage of banks on the Internet. The FFIEC Internet guidelines require in part "a monitoring system implemented to review continually the content and operation of the online programs to prevent inadvertent or unauthorized changes that may affect compliance with the regulations." After performing the Initial Web Site Audit, we will monitor your site either semi-annually, quarterly, or monthly to ensure continual compliance with FFIEC guidelines. The continual monitoring will authorize your home page to display our © seal. The Web Site Audit covers the federal regulations that apply to your institution's web pages. View an animation outlining the steps of a Web Site Audit. Read a newspaper article about a $4 billion bank that received some negative press because of an error regarding their Internet activities. This is one good reason to have an independent review of your Internet activities. For information about the different web site auditing options, pricing, company due diligence, etc., please complete the web site audit information form. Or, please email Kinney Williams at examiner@yennik.com or call 806-798-7119.
and Information Systems Audit and Control Association.